Reading Fangirl, I was all about Cather and Levi. The Simon Snow stuff was fun, but I was more distracted by a tall barista bringing Cath white chocolate mochas, aka the most delicious Sbucks drink on the planet, therefore Levi is the perfect man in my eyes. Point is, when I found out Rainbow was writing Carry On, I was pumped for more Rainbow, but unsure of the content as I am not a lover of the one called Harry Potter. However, I tend to put a lot of faith in the authors I adore, and if they said they were going to write a journal logging their bowl movements I would be like “YEAH I’M PUMPED FOR THAT!” because I believe in support. A good support system will take you far, and until any of these amazing authors do something truly awful, they will never lose my support. I’m rambling… the long-story-short version is this: I was excited for more Rainbow and skeptical about the story. In the end I came out with a new favorite ship who I will covet until the day I die. My name is Kylie, and I am SnowBaz trash. Super-amazing-totally-delicious-gay-shipping aside, this book was amazing. Rainbow is so freaking talented that my mind literally wants to explode when I think about it. She was able to take some snippets of info that we learned in between the chapters of Fangirl and make one book that was supposed to be the last book in a ‘series’ and, I personally, felt like I had known these characters forever; that I had been reading about Simon and Baz’s rivalry for years. All of this in one book. It was amazing. I don’t think I’ll ever love a ship as much as I love my sweet gay wizards. I have a looooong list of ships I cry over, but even the mention of SnowBaz makes me starts blushing and giggling and I just can’t hold back the mushy tears. I love those boys, and I was so excited when Katie said we have a hardcover copy of Carry On to giveaway and I could post about my feels! So be sure to enter and I hope you love this story just as much as I do! For more giveaways from our month-long blogoversary click HERE! Stay tuned for more!! BEA Part of It – Chicago Edition! Okay, I enjoyed Fangirl but I honestly had no desire to ever read another Rowell novel. 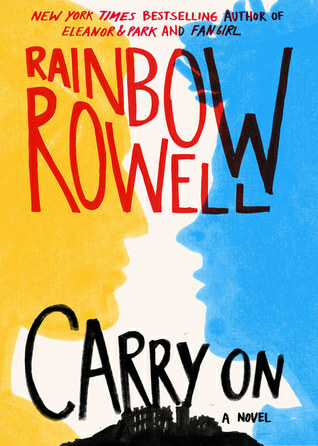 But I keep seeing Carry On everywhere and I like that it’s a fantasy and not a contemporary, so it’s been on my TBR now for a while. Also, everyone is in love with Simon and Baz so I just have to see what the deal is with these two characters! I have written fanfic in a way. Back when my son was young and the Harry Potter books were still coming out (when we started reading them only two were published) I wrote stories about a nine year old American witch based on that wizarding world. Thanks for this stellar giveaway! I actually have written fan fiction. I feel that quite often non-canon ships are more exciting and captivating. I have not, but I have definitely read a lot! Nooo I haven’t. I really tried to write something but it just never happened. And…well, not really. I haven't written fanfiction since I was 10 and where I imagined myself as a Harry Potter character in some silly notebook. It was entirely embarrassing and probably adorable. Alas, I no longer have that notebook (probably for the best). SnowBaz was so great! I really enjoyed Carry On; I worried that it would be too much of a Harry Potter rip off but I liked how she alluded to the series/story while making it her own fantasy world. Plus all those scones! Haha. And I loved Penelope too. Definitely a fun book.